Welcome to the sixth edition of the revived Limit Theory Fan Contest! This month will be about The Universe. It doesn't necessarily have to focus completely on the universe, but it must touch on the topic in some form. Be a little creative, and I'm sure you can come up with something awesome. Everyone can make as many admissions as they like, but only one can be the "official" admission by which you are judged. This could be in written form as a story, lore, or a detailed idea for a mod. It could be visual like a gif, photoshop or video. Or even audio - anyone up for a bit of stand-up about Limit Theory? These are just a few ideas off the top of my head, but I'm sure you guys can think of a lot more. It is fine to use other games' assets in your submissions, as long as your work is your own. The contest will be open to new submissions until Sunday, July 31st, 23:59 GMT. Some reference: obviously the title comes from the book of Steven Hawking (but the physic mistakes are mine ). The initial text comes from a song from Sash! (youtube link). The few models are made by yours truly. Ive never actually submitted it into anything, just made it cause i was hyped for LT. But my videos i made for LT, touch on the universe of LT(i think)? Idk, up to you guys. But if they count, i guess each video would be its own submission. The LT universe represents a group of ideas; Ideas that when bound together form the basis of a living universe. A universe where anything is possible, where you can be anyone, own anything, and have the freedom to pursue your own goals and interests. Through the years I have become inspired to write about game concepts that I find interesting and fun. Through my writings I have been able to create a vision for a game which I believe may come to light in the Limit Theory Universe. The below text is my version of what that vision may look like in Limit Theory. For the purposes of discussion the goods in the LT universe can be simplified into several major categories. Ore, which is used in construction of everything from stations to weapon blueprints. Fuel, which is used to power structures and ships. And finally crew, which control ships, post jobs, and make decisions based off of their experiences and environment. For the economy of this universe to prosper, ore, fuel and crew need to be traded and produced. This means that in the beginning of a newly developing system the average life of a civilian is likely either that of a trader or that of a worker who is manufacturing a product. Unfortunately not everyone wants an average life. Some will inevitably turn to piracy to get ahead of the average citizen. The life of a pirate is exciting and full of risk. In newly developing systems the pirate can roam free, stealing from the hard working miners and traders in order to gain substantial profits for very little effort. But soon the traders and miners will grow tired of loosing substantial portions of their profits. They will go to the local station or colony and place a reward for anyone who will damage and destroy the pirate threat. It isn't long before some of the traders decide to change their carrier to something that is both exciting and legal. They become the first privateers as they hunt down offending pirates and destroy them. But not all pirates are destroyed. Some flee and set up safe havens in nearby systems. While others venture deep into the dense nebula to plot their next strike. The most notorious of these pirates have large bounties placed on their names, leading to the rise of bounty hunters. While all of this is happening, new opportunities arise for the average citizen. The prices of goods rise and fall as pirate activity changes within the system. Some citizens place bets on which bounty hunter will take down the top crime lords, while still others will find ways to make a profit through reporting news of special events and happenings. The list of possible careers continues to expand as others look for profitable opportunities. Additional types of crime also become available. Hackers manipulate stock and commodity markets, target digital systems to transfer wealth between accounts, damage and clear personal and corporate information, and discover hidden agenda of governing officials. Smugglers transport illegal goods place to place, while assassins target corporate and political leaders. The list goes on and on. As more jobs are created, more illegal services become available as well. Groups of like minded individuals begin to form together. They create their own rules and goals which are dependent on the services they provide. With these organizations working together prices for goods begin to decrease and the citizens are able to afford a wider variety of commodities at a cheaper price. The organizations form under a faction. Factions interact in much the same way as the organizations within them. They fight, trade, create alliances, declare wars, and most importantly do what is in their best interest. It is these ideas that form the living economy of the LT universe. It is up to the player to exploit this system to the best of their abilities in order to make a mark in the universe and possibly rise to power. With the explanation of the inter-working of the economy in place, we are now ready to discuss manufacturing and research. As the economy continues to expand, the need to design and create advanced technologies becomes even more important. The free market which spurred job growth is also the same market which provides the commodities needed to maintain an empire. I imagine that there will be stations dedicated to both research and production of items. Research stations take time to develop technologies and proceed through the procedural research tree. This technology is then sold to organizations within the faction. It's the responsibility of the organizations to produce assembly chips based off of the blueprint of the technology and then sell those assembly chips to production stations. Production stations produce the items in the quantity given (dependent on the number of assembly chips) and then hire traders to transport the chips to commercial areas for sale. Organizations also have the option of keeping the end product if they pay for the materials used in the construction process, along with any labor costs. I did music again. This time, luckily, I had more time to put into it, so I'm quite happy with the result this time around. Of course, the theme is a tad hard for music, but I think I managed. I tried to illustrate the evolution of a star system in music: start as a gas cloud, slow accretion, star forming and planets, life springing up and colonising the system, the system being torn apart by war, slowly rebuilding to its former glory, after which everything gets wiped out by a supernova. Anyway, here it is: Lifetime of a Universe. Also, fun fact: the track is 3:14 long, and that really is a coincidence. Will put it on Soundcloud later, but my internet is too bad atm to get anything uploaded there. Here's my entry, the result of a considerable amount of research into ancient Hebrew literature, Old English grammar, of headscratching, and of procrastination. Hope you like it! This being a history of the generation of the Universe of Limit Theory, as handed down by forum posts. In the beginning there were limits. Josh looked upon the limits, and saw they were bad. The spirit of Josh moved and said, “Let there be Theory!” And there was Theory. Theory of no limits. Josh took the Theory and made with it an Engine. The Engine was without limits, as it was created of the Theory. Into the engine Josh breathed life in the form of Procedural Generation. Procedural Generation was without limits, born also of the Theory within the spirit of Josh. But Procedural Generation required direction. Therefore Josh directed it, and ordered its algorithms. The spirit of Josh looked upon the Universe, and was dissatisfied. Limits yet existed, contradicting the Theory. Angered, Josh destroyed the Universe and redirected the algorithms within a new tongue. The new tongue directed the algorithms in a well-changeable manner. And allowed the Theory to be fulfilled. Not only by the spirit of Josh, but also the spirit of others. Yet limits remained. The Engine itself was tainted. Therefore the spirit of Josh, looking upon the Engine and yet seeing limits, was stirred to remove them. But they were a part of the Engine. Therefore Josh dismantled the Engine, and breathed new life into it in another tongue. And this tongue also was spoken by the Procedural Generation, being of the Engine. And the algorithms therefore also spoke the new tongue, being of the Procedural Generation. The new Engine was truly without limits, according with the Theory. Therefore Josh conceived of a new Universe, conceived with the Theory. And constructed with the Engine. This Universe was truly also without limits, according with the Theory. Yet construction of the Universe was lengthy, and the length of patience of those Humans who wished to inhabit the Universe grew short. Many despaired and abandoned the Theory, seeking other Universes. Those would never know the true happiness of Life without limits. For one day, the construction came to an end. And the Universe was fully created, without limits, according with the Theory, and well-changeable by the inhabitants. Heh, 19 minutes to go and I got it in! And now, for the results of the July 2016 "Universe" competition! The available prizes are the $30 voucher and Sol Trader. 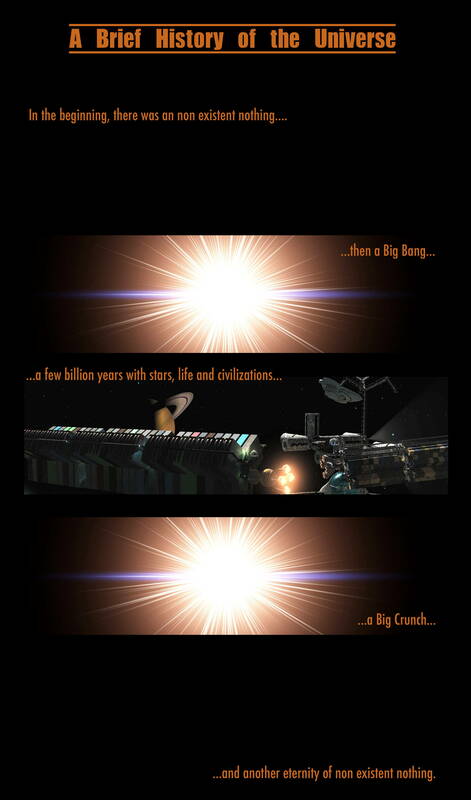 The first place winner is: HowSerendipitous, for his entry Carl Sagan Quote Comic - with a score of 85.33!! Dinosawer with a score of 81.33 for his entry Lifetime of a Universe! One of our judges declined to make comments this month. I think you know as well as everyone else that this has absolutely nothing to do with LT or, especially, the universe theme. I'm going to have to dock some major points here. Nice animation anyway. Catsu, I see the theme was hard to hit. Still cool regardless though. Interesting video. Would be good for another contest, but I have no idea what this has to do with the theme, or LT. The repetitiveness of the universe? No life without destruction, no destruction without life I guess. I liked it, fit the theme well. Hmm, fits with the theme very nicely and nice models in the 2nt panel, but other than that... Meh, to be honest. I would debate the "big crunch" thing, but I think that lies outside the bounds of this contest. It's pretty well done! Not as humorous as your other entries to be sure, but this was a difficult month. Both videos are good, they are among the best fan-made trailers. You can't get more true to LT than footage of LT, but editing and putting in music isn't something I can consider very original. I think I really needed this. It reminded me of why I fell in love with Limit Theory in the first place. I'm not sure how much of it is about the "universe" theme in particular, but I really enjoyed it. Seems to be a well thought out manuscript of LT - or a design doc, if you will. This is a very nice description of what we expect out of LT, and I can definitely get the connection to the theme. This IS the Limit Theory. I like it. It took me a little while to get into it, but I rather liked reading this. The Universe really seems to be a tough theme, but you did a decent job, and it kept me interested throughout. Nicely done! Epic, well done! This really gives off a "grand universe" feel. I envision moons, planets, stars, and whole galaxies going by while flying around the cosmos at crazy speeds. All majestic n' whatnot. Very choice. I'm keeping this. Permanently. This is going in my library and I will listen to it over and over again. Does that tell you what I think of it? I really like this. It was well-composed. I'd love to be exploring the universe to this track. Whether it's about the universe comes down to interpretation, but I think you did well. We had an entry very similar to this once... but the story of Josh repeatedly recreating the universe because he was never satisfied amused me. Were you really writing about the Universe, or the Forums? It did feel rather repetitive, though. I think you said "without limits" a few too many times. These are the days we lived, good job making us sound like a cult. I approve. And the Judge looked upon this story. And he saw that it was good. And he said unto the contestant "They work is fair and consistent and brings joy to those around you." And the Judge did thus bestow upon the contestant a sufficient score. Well done. Love how you handled this. You mention that it would be prettier animated; I agree, and deduct because you slacked off! :V I kid. Oooh, a Carl Sagan quote, and well used! Quite beautiful pictures as always - you've done an amazing job. Would I be wrong in assuming this was going to be shot in one take, pulling the camera outwards from the planet's surface? If so, that's incredibly impressive. I wish I could've seen that. Prizes will be handled now in the comments thread! HowSerendipitous, you're first up with a choice between the $30 Steam/GOG voucher and Sol Trader!